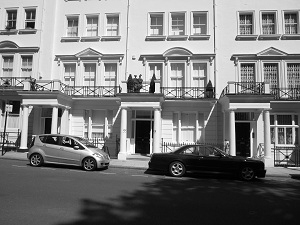 Today Spick and Span window cleaners rapidly responded to a caller who required an emergency window clean in SW10, Chelsea.The owner of the four storey property, just off Fulham Road, was moving house and so desperately needed window cleaning before leaving the property. Within just one and a half hours of calling, the window cleaner was on location at Chelsea and spent just two hours at the property cleaning, which was the time that the homeowner had specified. The windows which required cleaning on the inside and out, were comprised of mainly multi-paned Georgian -style sash windows , but there were also french doors and fanlights that were cleaned. It had been one whole year since the windows were last cleaned, and there was staining on the outside of the glass which were the remains of plants which cling to the glass and which were growing outside of the property, also dust from building work in the area had stuck to the glass. As the house was being cleaned internally by the properties owner, work started at the top of the home, the third storey. Sash windows were washed inside with a window cleaner hand mop and the soapy residue was wiped with a squeegee, the frames were wiped afterward. To clean the outside, the bottom sash window was raised and an extension pole was used and the cleaning process was repeated . With the multi-paned sashes a quicker cleaning method was used involving a wet and dry scrim. First the window pane was scrubbed with a wet scrim and afterward a dry scrim was used to buff out any smears.On the second floor two french doors, with glazed panels were cleaned, the tops of these were cleaned with an extension pole, and the lower parts were cleaned with a mop and squeegee. A ladder was used to access the taller paned sashes on the ground floor of the house. At the the front of the property was a basement which meant reaching the living room window would be difficult, however Spick and Span windows cleaners came equipped and made use of the latest window cleaning technology on the job, by employing ladder-less window cleaning, which is the method of cleaning windows with purified water that is pumped through an extension pole with a brush on the end. With this equipment the window cleaners were able to clean the window effectively. The homeowner remarked at how much difference it had made with the windows now made cleaner.